A new generation recovery unit is here! The all new G5 Twin Refrigerant recovery machine. The G5 Twin was designed from the ground up to provide the best recovery speeds in all conditions with the smallest size portable unit-all at a price that will make you smile. The G5 Twin starts with an extra heavy-duty crankcase for driving twin pistons. These twin cylinders allow for greater throughput for both liquid and vapor phase. Just take a look at these performance comparisons. Across the board, the G5 Twin is up to 188% faster in all conditions. 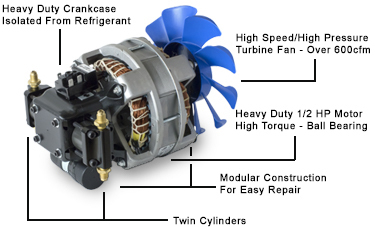 The G5 Twin's crankcase is completely isolated from the refrigerant flow, no vapors mix in. As a result, the main drive of the unit will last much longer too. Liquid slugging is now a thing of the past. 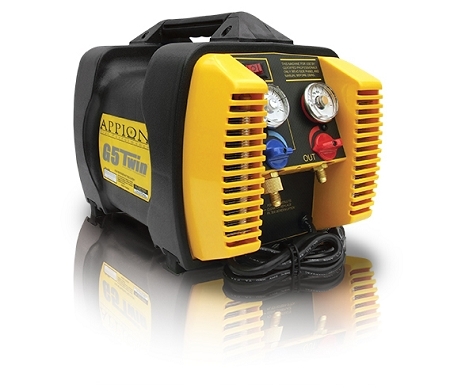 The G5 Twin pumps vapor or liquid refrigerant without throttling. No clog prone orifices or other liquid flashing gimmicks to cause maintenance problems down the road. Just as the V8 allows automobiles to purr along, the G5's twin cylinders even out the loads while delivering greater pumping speeds for both liquid and vapor. The case is designed for maximum durability yet with a soft gripping rubber ergonomic handle. Once you experience the greater performance of the G5 Twin, single cylinder machines will be obsolete. The G5 Twin is designed to be easy and quick to assemble. It turns out, it's easy and quick to take apart too. This makes repairs quick and easy. The entire unit can be completely rebuilt in about 20-30 minutes with simple tools. All of the parts are easily accessed and replaceable for long life. Since it is so quickly assembled initially and so easily repaired in the field, the G5 Twin is the best value of any machine in its class. Buying a recovery machine over the Internet? Sounds like a crazy idea? There's no risk! You've got 90 days to try it, love it, or return it for a full refund! Few products can guarantee you satisfaction like this, but we believe and the manufacture believes that Appion make the best recovery units available. It's fast and has never let us down. Appion is definitely doing it right.